Are Sixers willing to give up a valued asset for postseason push? 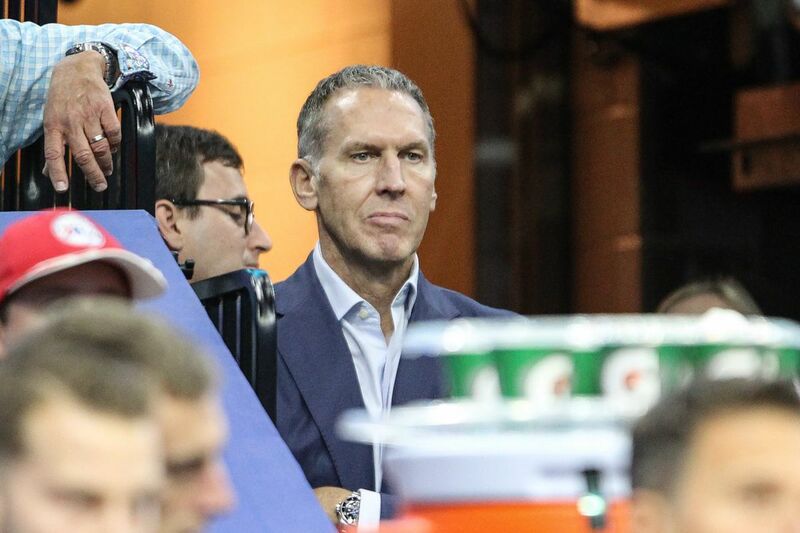 Sixers’ GM Bryan Colangelo will have to decide what more important, stockpiling assets or making a postseason push this season. INDIANAPOLIS – The 76ers have practiced patience in their rebuilding process. The goal at the beginning of the season was to develop Ben Simmons, Joel Embiid, and Markelle Fultz while reaching the postseason. For veteran leadership, the Sixers signed JJ Redick and Amir Johnson to one-year deals. They later acquired Trevor Booker, who is in the final year of his deal, in a trade from Brooklyn for Jahlil Okafor, Nik Stauskas, and a second-round pick. All the while, the Sixers were going to keep their primary assets intact while freeing up cap space to go after A-list free agents in July. But Saturday night's matchup against the Indiana Pacers marked the 46th consecutive game that Fultz has missed while trying to reclaim his shooting stroke. The absence of the first overall pick in June's NBA draft leaves a huge void. The Sixers don't have a guard who can create his own shot and provide instant offense. There are two on the market: Tyreke Evans of the Memphis Grizzlies and Lou Williams of the Los Angeles Clippers. The Grizzlies want to receive a first-round pick as part of any package for Evans. A league source has confirmed that the Sixers have expressed interest in Evans. There's also a report that they've inquired about Williams, who broke in with the Sixers. The Boston Celtics, among other teams, are also interested in both players. The Celtics are willing to give up some sort of asset. That could drive up the asking price. That brings us to Thursday's 3 p.m. trade deadline. Will the Sixers give up a cherished draft pick for a player to help them advance to the postseason? The Sixers took a 25-24 record into Saturday's game. They were in eighth place in the Eastern Conference with 33 regular-season games remaining. The conference's top eight teams at the conclusion of the regular season advance to the postseason. The Sixers were three games out of fourth place. However, the Detroit Pistons, who acquired Blake Griffin last week, were just 1½ games behind the Sixers. A number of other teams in postseason races are expected to at least partake in serious trade discussions in an effort to upgrade their roster. So the Sixers would basically just be keeping up by making a trade. But, again, are Evans and Williams worth a valued asset? A ninth-year veteran, Evans has a lot of experience and is a proven NBA player. The 28-year-old is averaging 19.5 points, the most since averaging 20.1 in his rookie season. He's also having a career-best season in regards to foul shooting (79.9 percent). However, he might not be a great fit. He needs the ball in his hands. Simmons also needs the ball. So they wouldn't be an ideal pairing on the floor together. Lou Williams (right) could be a target for the Sixers, who gave Williams his first stab at the NBA in 2005. However, Evans does have ties to the area. The Chester native played at American Christian Academy in Delaware County and was The Inquirer's Southeastern Pennsylvania player of the year in 2008. Meanwhile, the Sixers selected Williams with the 45th overall pick in the 2005 draft out of South Gwinnett High School in Georgia. He spent his first seven seasons in Philadelphia before signing a free-agent deal with Atlanta on July 12, 2012. Williams would be a better fit with the Sixers. He doesn't need the ball. The big benefit with Williams is his ability to draw fouls and get opposing teams in foul trouble. He's having a career year, averaging 23.5 points. While he's been recently starting in Los Angeles, Williams prefers coming off the bench. He's known for coming in and providing instant offense. He could also pair well with Simmons. Another player to consider is the Atlanta Hawks' Marco Belinelli. The 31-year-old is shooting 37.6 percent on three-pointers during his 11-year career. He would bring consistent long-range shooting off the bench. The Sixers could always use shooting since they're inconsistent in that area. The team's cap space for next season wouldn't take a hit due to all three players having expiring contracts. Giving up a future second-round pick in a package for any of the three would be reasonable. But it would also be reasonable for the Sixers to continue to go step by step in their rebuilding plan. There's no need to cheat the process by trading a valued asset just to maybe get up to the sixth seed in the playoffs. Let's face it, sixth or eighth seed — it really doesn't matter because the Sixers aren't winning a championship this season. So unless it's a game-changer, they would be better off keeping all their assets, then make better use of them in the 2018 draft. They could use them to select a player, make a trade for an A-lister or make a trade to move up in the draft.